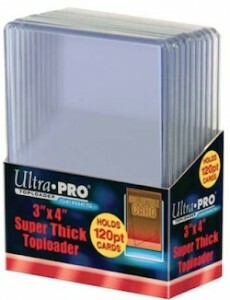 Ultra Pro Toploaders are some of the most readily available and budget-friendly card protection options for collectors. Featuring no frills, these basic cases are composed of clear PVC. Due to their hard plastic composition, toploaders are intended to be used with Ultra Pro Card Sleeves. 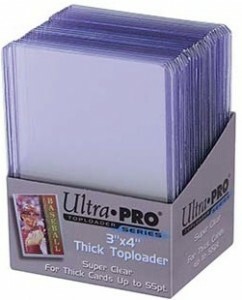 While not recommended for long-term storage or display of high-value cards, toploaders are a great way to protect your low and mid-value cards. Ultra Pro Toploaders have also emerged as the preferred method for card shipments with collectors and card companies alike. The only thing that is generally added is a single piece of tape at the opening of the toploader, to prevent the card from coming out of the case while in transit. Because they do not feature any UV protection and also contain open tops, they work best when used to store cards in a darkened space, like a box or safe. They also a great short-term protection option for high-value cards. This way, your valuable cards are still subject to basic projection until you able to obtain a One-Touch case or other premium storage option. It is very important to get the correct toploader to fit the card in question, as a case that is too tight can seriously damage a card. Also, a case that is too big will allow the card to shift and risk damage. The majority of these cases are the standard 3"x 4", which fit all 2-1/2" x 3-1/2" cards. There are specialty cases available as well. 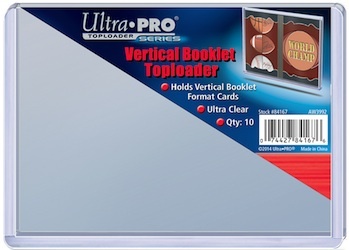 In response to feedback from card dealers and breakers, Ultra Pro also offers bulk orders for several of the most common toploader sizes. 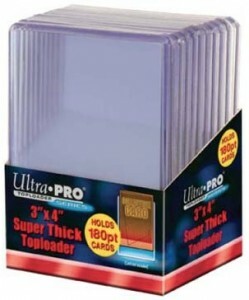 Available from Ultra Pro distributors, the following toploaders can be ordered in quantities ranging from 1,000 to 2,000 toploaders per case. 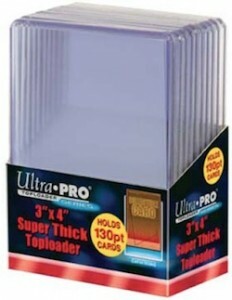 Pack of (25) Ultra Pro 5x7 Clear Hard Rigid Top Loaders Lot New! 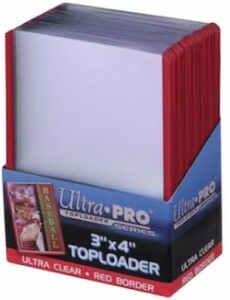 As the most common way to protect individual cards, there are plenty of choices when it comes to Ultra Pro toploaders. Although most of the differences are based on the size of the card in question, various color combos and labeling is also available. Border colors include black, red, blue or white. 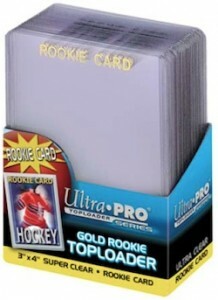 Includes "ROOKIE CARD" foil hot stamp in white or gold. 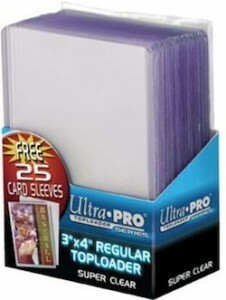 Includes 25 additional card sleeves for use with toploaders. Fits thick cards, such as relics. This includes cards from 36 - 55pt. This includes cards from 56 - 75pt. 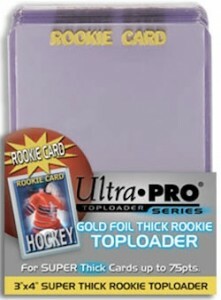 Includes "ROOKIE CARD" foil hot stamp in gold. This includes cards from 76 - 100pt. This includes cards from 101 - 120pt. This includes cards from 121 - 130pt. This includes cards from 131 - 180pt. Although book cards are some of the most popular high-end card options, there has not been a great variety of ways to protect these oversized cards. In addition to the magnetic booklet cases, there are also toploaders. These large plastic cases are simple and inexpensive and offer a great temporary storage solution for booklet cards. They do not require soft sleeves like the other toploaders, so be extra careful with the corners when you insert them into the toploader. Fits vertical book cards, approximately 4" x 5-3/8"
Fits horizontal book cards, approximately 3" x 7-9/16"
What top loaders would you recommend for thickets card to be graded.I heard different stories. Supersitz � It really just depends on how thick the card is. The major grading services prefer semi-rigid cases + soft sleeves for submissions, so ideally you would always go this route if you can. However, use common sense. If it is clearly not going into the semi-rigid case easily, you are risking damage. Pay particular attention to the corners. In the event that a semi-rigid does not work, basic thick toploaders are your best bet, and you will want to use a soft sleeve and then put the toploader in a team bag. Regardless of what you use, just make sure the card fits properly in the case. As difficult as it is to get the card into the case, it will be just as difficult to remove it and you are exposing the card to 2x the chance for damage. What toploader would you recommend for Topps 1976 Baseketball cards? 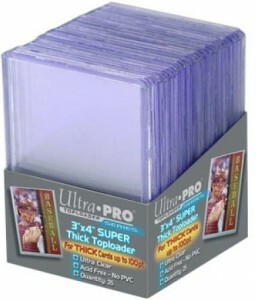 josh � Since they are extremely large cards, your best bet looks to be the 4×6 toploaders that Ultra Pro makes. Hi, You mention that toploaders “While not recommended for long-term storage or display of high-value cards, toploaders are a great way to protect your low and mid-value cards.”. I was wondering why you think toploaders are not recommended for long-term storage? You suggest one-touches for long term storage or for protection of high-value cards, but while this is good for protecting the surface of a card, just about every card will slide around in a one-touch leaving cards susceptible to corner and perimeter damage. Please elaborate your thoughts on best practices for long term storage of cards and protection of high value cards. And please explain why you don’t like toploaders as a long term option. I have many nice vintage cards and constantly think of the best way to store them. Thanks! There is really no perfect solution. For the record, I use both. Most of my cards are low and mid-value cards and are stored in toploaders. Trey, In reading the comments above, I am curious to know what you would consider low-mid value in terms of dollars, and what you might consider to be high value? $100+? $500+? Just personal value? David � Nothing is set in stone, but I usually consider anything under $75 to be low/mid-value. Hi, I’ve recently got into the hobby and have acquired a couple of decent value cards $200+. I have the cards stored in magnetic one touch cases. I obviously want to keep them safe in a one touch.The problem I have now is how to store the one touches! How do you store yours and can you recommend any type of case or box that will house them? Andrew � I just use the basic cardboard storage boxes with rows that are wide enough to hold magnetic cases and are about the same size as a shoe box. You should be able to find them on most card websites that sell supplies or on eBay. I wanted to ask you on your opinion on Panini Stickers. I am collecting the World Cup stickers. I just want to know what do you think about using Top-Loaders with Sleeves? I am currently using Sleeves and Top-Loaders with team bags where I place then inside a shoe box. I got other people’s opinions and they said something too much protection will cause more damage and stickers are indeed more fragile then cards. Please let me know on what product is good for my collection I’m trying to keep them in mint condition. Thank you for your time! Ilias � I also collect them and it makes sense that the team bag might be a bit much. The toploader and sleeve should be sufficient. It is more about how you handle them. Cards are best preserved when they are out of the light (the shoebox is a solid way to handle that) and not jostled around much. Thank you for your reply Trey! I am doing research to see what’s best for my stickers. I even thought about grading them just for long term preservation and probably best for protecting them. What’s your thoughts on grading stickers? Since they are fragile and some are inexpensive aside from price on grading would this be the best result? Also another question you mentioned something about sleeves that some have small imperfections in soft sleeves can leave a mark on the card? Can you explain what you meant by that. How about a guide on determining thickness of cards. Average collector doesn’t know the difference between a 55 pt card to a 135 pt. when I started I would buy the wrong too loaders. 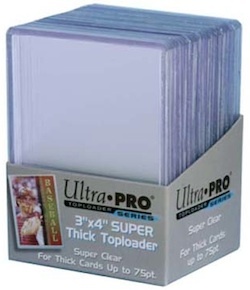 I have a number of thicker cards that I will store in a soft sleeve inside a top loader. I would like to store all these top loaders in a standard binder. 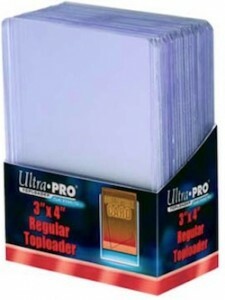 Can you buy binder pages that hold top loaders? Is this even recommended?